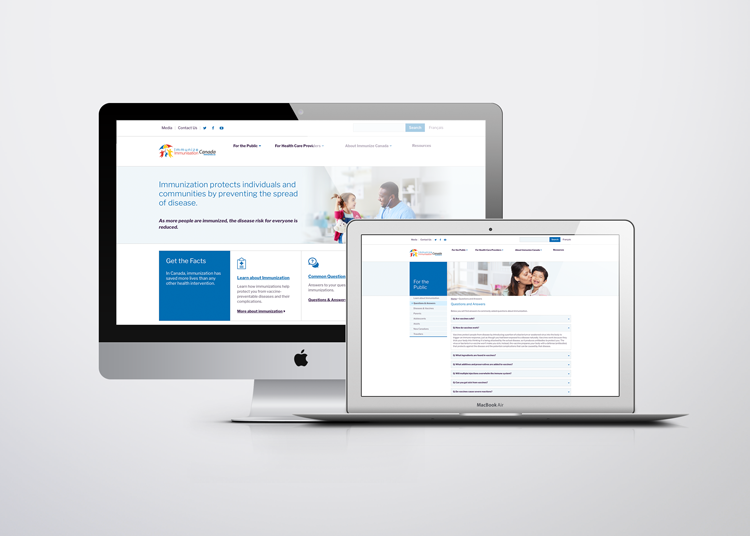 Immunize Canada was in desperate need for a mobile-friendly and accessible website that conveyed professionalism, credibility, and excellence. The design, architecture, and technology of the site were several years’ old, and the age of the design had a negative impact on the organization’s ability to communicate effectively. Immunize was also faced with the challenge that many of our non-profit clients have: how to use a single digital property to speak to distinct audiences. On the one hand, members of the public—often parents—visit the Immunize Canada site for guidance and reassurance. They are looking for a trustworthy and approachable resource written in plain language. On the other hand, healthcare professionals visit the site for professional resources and reference material. They are looking for evidence-based and expert-reviewed information that is well organized and thorough. Health care providers require information on how to counsel the public, promote immunization, how to find education & training, and discover events. The challenge on the technical side was that the site was running on a legacy Content Management System (CMS) which was not meeting the needs of users in the organization. Content owners were unable to change navigation elements or put content where they wanted it. Furthermore, content owners were maintaining a separate content platform to serve resource information. This made updating information difficult for staff and searching information disjointed for the user. These were all familiar challenges for Industrial. 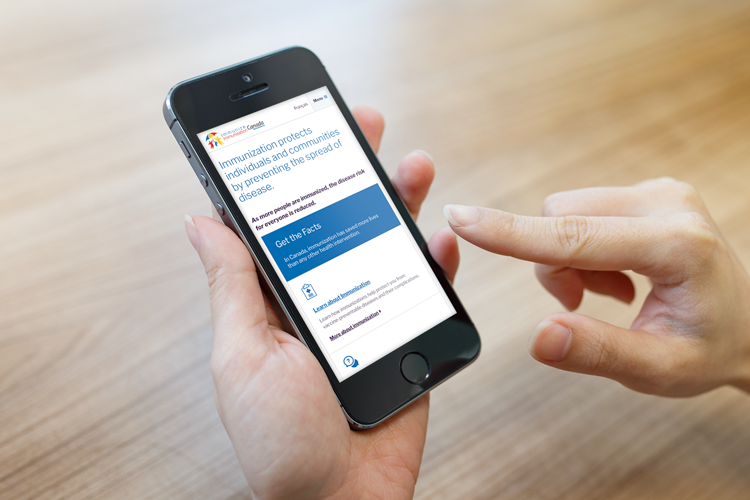 The redesign and redevelopment of the immunize.ca website offered an opportunity to tackle the challenges with modern design and technical strategies. By offering great user experience and a flexible content management platform, we were able to help both the user and the staff of Immunize Canada. On the content side, we immersed ourselves in the history of the site by examining analytics, content vocabulary, and categorization. We collaborated closely with Immunize to increase findability and create a clear information architecture for their content. Using analytics data to identify the big picture in terms of visitor behaviour, popular content, and outdated or unfindable content, Industrial was able to determine that the introduction of a mega menu would increase findability of content by building intuitive navigation based on Immunize Canada’s target audiences, the public and health providers. The addition of navigational callouts, icons, and colour blocks help guide user experience. A more powerful search, a user-friendly navigation, and a flattened hierarchy mean that visitors can navigate to content quickly, with confidence that they found the right page. And of course, redeveloping the website to be mobile-friendly was a key part of making a better user experience. Visitors can now get their hands on information on the go. On the visual side, we used our tried-and-tested design process to create a concept that is fresh, modern, and approachable. The new design is clean and professional without being clinical. A clean palette lightens the feel of the site, while the use of engaging photography conveys compassion and highlights the human side of health and immunization. Furthermore, the new site meets accessibility standards set out by the Accessibility for Ontarians with Disabilities Act - AODA as well as meeting the World Health Organization's Vaccine Safety Net criteria. On the technical side, we deployed the open-source Drupal CMS platform. The ease-of-use and flexibility of Drupal empowered Immunize Canada content owners to maintain content without requiring technical skills. By shifting to an open-source solution such as Drupal, Immunize Canada will better position itself for future expansion of the website, provide improved authoring and content management capabilities, and improve overall content discovery and will position Immunize Canada well for future growth of their website. By recommending the newer version of Drupal, version 8, we further strengthened Immunize Canada’s position for future growth on the site. Through close collaboration with Immunize and careful attention to detail, Industrial was able to transform a stale digital presence into a modern and approachable new website. The fresh design, user-friendly navigation, and human element convey compassion, reliability and professionalism. We were delighted to know that the new UX will put get visitors to the content they need quickly and easily. We were also delighted that we were able to empower the staff at Immunize Canada to easily manage their content and maintain the look and feel of their new site. The goal of Immunize Canada is to contribute to the control, elimination, eradication of vaccine-preventable diseases in Canada by increasing awareness of the benefits and risks of immunization for all ages via education, promotion, advocacy and media relations.